Do you want to cancel your Club Membership at local Gym? Download this Gym Membership Contract Cancellation Letter template now! So you are currently having a gym membership, but you expect to stop using it and you are paying for a monthly membership? Now if you signed a month to month contract you should be able to terminate with given days, make sure you read your contract or talk to a sales advisor or gym club manager! Make sure that you do not talk with their corporate office because chances are they have no idea what you are talking about, they do not know you so they will also not act on your request. Sometimes you will end up in their call center, which might not be in the same country if it's a big gym. Make sure you read your gym subscription contract first before you contact the fitness club. If you are in contract and you cannot afford it right now, some gym has the option to “freeze” your account with no cost to you. If you are in contract and you just do not care anymore some people ask their bank to change their card and some gym will actually just terminate your account if they do not have a new card on file. 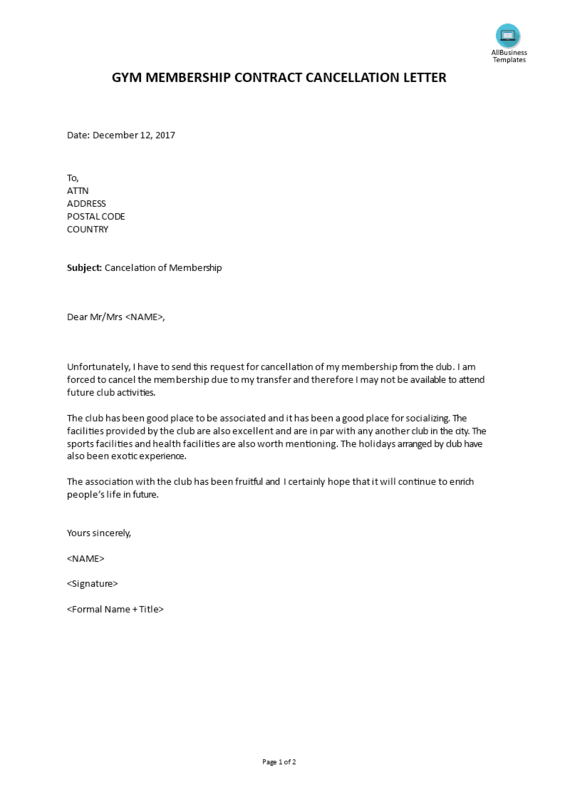 This cancellation letter template is an example of a cancellation letter that can be used to end a gym membership (such as to a gym or club). By sending a written letter, you can eliminate any room for misunderstanding and have you can ensure you have written proof of your request. Before writing your own cancellation letter, you should take a close look at the contract you have with the gym. If you signed up for a specific membership period, you might be obligated to fulfill the terms before your cancellation can be processed. It can be that your gym allows for early cancellation. In many countries and states, for example, that you might be eligible for early cancellation if you're moving to another city that is too far away from the gym. In order to rapidly manifest your needs, you need to get clear on paper exactly what it is that you want. This letter to cancel gym membership template will help you structure your thoughts in a professional way! Download and modify, and you can send your customized cancellation letter to your gym in minutes.